On the 1 December 2018, Hoffman travelled to Paris with about 50 other people from Morbier, a small village in the Jura region of France. Hoffman, who used to be a soldier but now works as an artist, says they went to participate in the protest and to take photos. The demonstration that day was one of the most violent “actes” in the Gilets Jaunes movement, which began as a series of protests against fuel tax rises in November last year, but has quickly morphed into a wave of direct action expressing anger at a number of perceived social injustices. Initially Hoffman was frequently among the protesters, but this changed after the march in December. Hoffman describes how in the chaos, amid clouds of tear gas, he ended up losing his friends. As the crowd dispersed, he found himself alone near the Arc de Triomphe, where he stood taking photos. The police started to attack the remaining protesters with a water cannon and people scattered. It was then that he felt a huge impact. No one was around him. He says he felt like his brain had stopped. He needed to get out of the fog and tried to move forwards, but quickly collapsed in the street. He was taken away by street medics and was later told by a surgeon that he was two millimetres away from having his carotid artery severed. Hoffman is one of hundreds of people to have been shot by a police flashball, a weapon which fires rubber bullets with the power of .38 calibre handgun. The flashball has been deployed consistently for crowd control since its introduction in 2002, injuring thousands of people and killing one. During the Gilets Jaunes protests the weapon has been used with shocking frequency. Since the incident, Hoffman has been suffering from PTSD and depressive episodes that a psychiatrist has said stems from the injury. As an ex-soldier who “fought for France”, Hoffman says the attack has been “psychologically… very hard to accept”. Unfortunately Hoffman’s experience isn’t particularly unusual. As the Gilets Jaunes protests have progressed, activists say this kind of state violence has become commonplace. In the most recent protest on 23 March, troops from Operation Sentinelle – a military division established after the 2015 Paris terror attacks – were on standby at some of the protests and a 73-year-old woman sustained a fractured skull after riot police charged demonstrators in Nice. 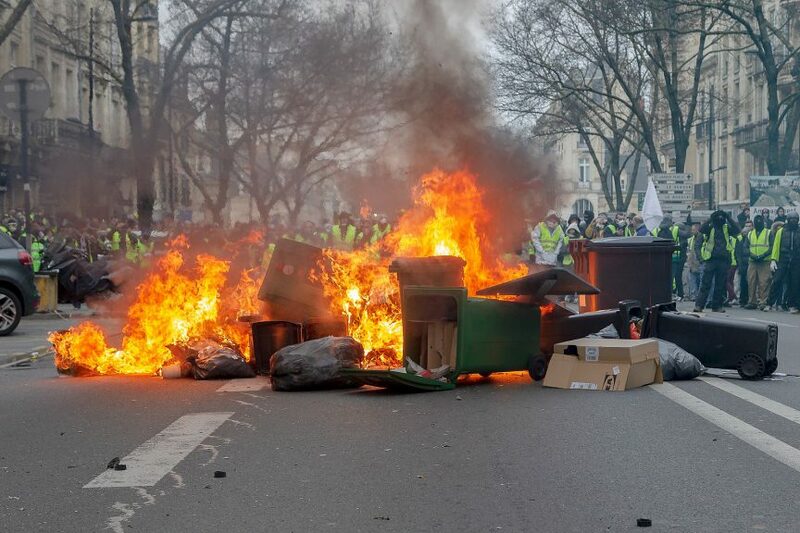 Police and the French state have sought to justify the violence by arguing that it is against “casseurs” – rioters, thugs and members of the black bloc. But only a tiny proportion of the protesters could be described as casseurs while the scale of police violence has been enormous. Corinne, who asked to be identified by her first name only, is a street medic. She says on one occasion she was told by riot police to take off her gas mask while performing first aid in heavy teargas. She says the implication was that she needed to be subjected to it as well. There have also been multiple incidents of journalists injured by police. Floriane Chabot, a hospital administrator, was protesting on 12 January in Bordeaux when towards the end of the day, in the main square, casseurs turned up and started smashing the windows of a bank. Chabot watched, but she says it was clear she wasn’t one of them and she stayed quite far away. When the police arrived the casseurs rapidly departed, but the police began to fire flashballs at any one else that got in their way. Chabot was hit. The flashball gouged out a sizeable chunk of her calf. Images Chabot shared with Novara Media are too graphic to publish, but show horrific damage to her leg. She was injured so badly that she is still visited by nurses, sees a therapist for her nightmares and only returned to work on 18 March. Her husband is a driver earning minimum wage and since Chabot has been unable to work the couple has struggled to make ends meet. 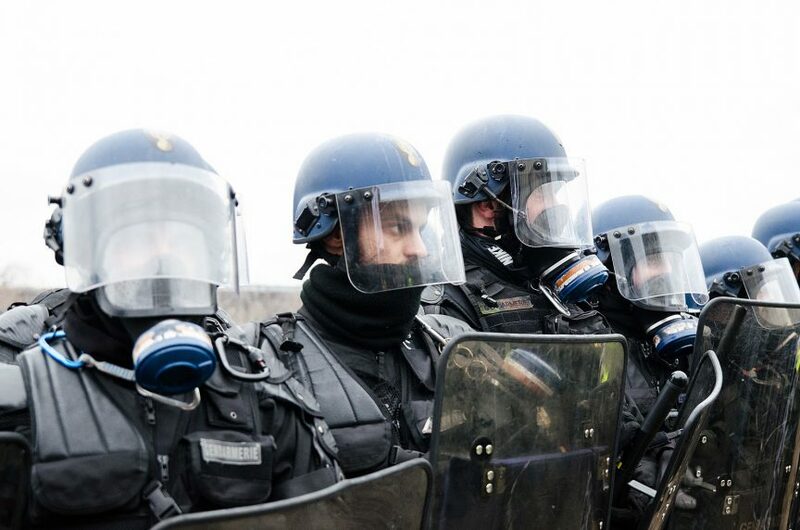 On 6 March the United Nations (UN) opened an enquiry into excessive use of force against protesters in France. There is also a resistance building within the country, which takes three broad, intersecting forms. The first is a campaign by Gilets Jaunes on the ground and on social media. The second involves pre-existing grassroots organisations that have been thrust to new prominence by the spate of recent violence. The third is an attempt by members of the movement and allies to mount legal challenges against the police and to bypass the French government, which has repeatedly ignored their concerns, in order to take their plight directly to the UN. Increasingly, groups of injured Gilets Jaunes march together and others march specifically in solidarity with victims of police violence. 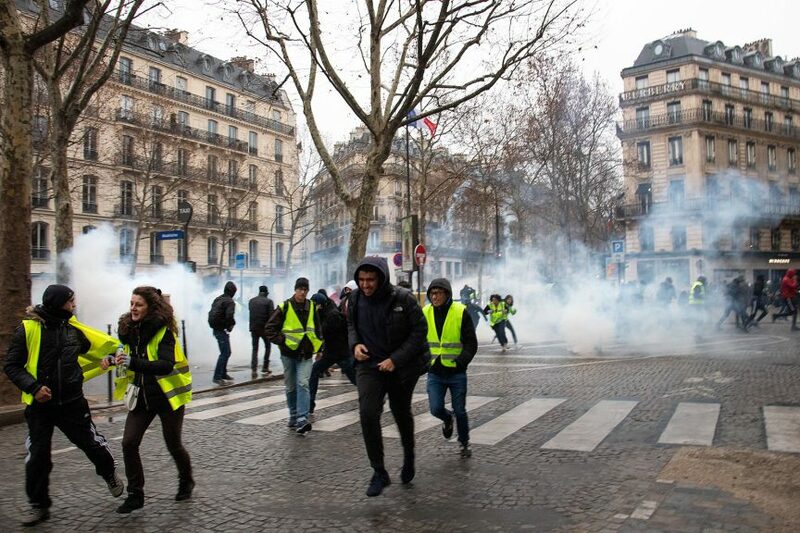 In January and February, there were several victims’ marches including one in support of Sebastien Maillet, a Gilet Jaune who lost his hand due to an exploding tear gas grenade. Many were organised or promoted by the “Ban the grenade and Flashball” Facebook page, which is run by victims of police violence turned activists, who are trying to prevent their experiences from reoccurring. Antoine and Axelle are two such activists who have appeared in dozens of Youtube and Facebook videos on the page describing their injuries (Axelle a broken jaw, Antoine a severed hand) and calling for teargas grenades and the flashball to be banned. These videos have had hundreds of thousands of views and Antoine recently spoke to a journalist from the Guardian to explain his situation to an English audience. One of the organisations pushed into the foreground by police violence in the Gilets Jaunes protests is Desarmons-les! (disarm them), a radical collective that originally formed after the violent treatment of anti-nuclear protesters in 2012. Dersamons-les! (DL) run a website, which documents instances of police violence, examines the different weapons used by police and comments on contemporary policing policy. They also organise and promote marches and protests against police violence. Their most recent demonstration was in Hay-les-Roses, where the police are trialling new ‘intelligent’ arms systems involving a visor with heads-up display that sounds an alarm when the shot would be ‘non-regulatory’. DL argume that there is no such thing as ‘intelligent’ weapons: they should all be banned. The group is deliberately uncompromising. Ian, a DL activist, says they don’t exist to enter debates about police reform, instead they prefer to help victims through legal battles and support them through psychological struggles. DL’s ‘assembly of the wounded’ can be found all across France and they are trying to create an official union. Interestingly, DL’s guiding principles are Marxist, Ian says that they believe that we are witnessing the “collapse of the capitalist economy” and that the police are being increasingly militarised to try and crush future uprisings. Their radicalism though hasn’t prevented them from becoming a regular source of information and commentary in the media, and they have been cited by many mainstream French outlets. Other organisations that have returned to relative prominence due to recent police violence are the campaigns for justice for the black citizens Adama Traoré and Gaye Camara who were murdered by police in 2016 and 2018 respectively. The Commité Adama and the campaign for truth and justice for Gaye have lent their expertise to the movement and have been furiously holding and promoting marches up and down the country, emphasising the link between state violence and state racism and the need to fight these evils together. In return for helping the Gilets Jaunes, Traoré and Camara’s causes have gained more traction. High-profile members of the Commité Adama who are also Gilets Jaunes supporters, such as the novelist Edouard Louis have helped cement the idea that these are causes that need to be fought together. The newest form of resistance to state violence is 34-year-old former archivist Shirelle David, who has essentially become the Gilets Jaunes envoy to the UN and is now attempting to take their cause international. David has been an organiser since the very beginning of the movement, helping prepare for the initial November demonstration in her local area. When it became clear in December 2018 that the Gilets Jaunes would face significant resistance from the state, David began keeping records on the movement. She issued an appeal for testimonies on social media, at first for the judicial records of the thousands who were arrested protesting, but it quickly became apparent that medical records of the injured would be necessary too. She received 400 initial responses and began to get in contact with victims. In light of the sheer numbers coming forth with their testimony she and others in her area organised a protest against police violence. Shortly after this David was invited to Geneva (with Hoffman and a handful of others) to meet with UN officials and present her findings. Her primary task at the moment is managing the Facebook page she established to collect victims’ testimonies and collecting more evidence. She encourages people to speak to her or the other admins and has compiled a dossier on the police violence. She is in the process of sourcing experts from among the street medic teams and she is on the look out for a psychologist with experience of the protests. David estimates that since the beginning of the movement around 2,500 people have been injured, around 200 severely so. She speaks passionately about people that have stopped protesting out of fear, victims that have developed agoraphobia and how this is human rights violation. Surprisingly, the testimony David has collected includes that of police. One officer, she says, told her he had become suicidal as a result of the pressure he was put under to use violence against protesters. These three disparate strands of a growing movement all use different tactics, but they are united in the common goal of ending violence, achieving justice for victims and banning dangerous police weapons. They also share an analysis: they all believe this is not a problem with individual police, but a campaign of repression on behalf of the state.